The Mudéjar Architecture of Aragon is represented by 10 buildings that are the most outstanding examples of Mudéjar art and architecture. Mudéjar is the style of Iberian architecture and decoration strongly influenced by Moorish taste and workmanship. The included sites cover the whole period, from the 12th to the 16th century. The architecture is characterized by bell towers shaped like the islamic minaret, the use of bricks, glazed tiles and wooden ceilings. In preparation of this trip I had been researching the 'Mudéjar' concept for a bit, as I knew nothing about it. The difference with the famous Moorish architecture in Spain (the Alhambra for example) is that Mudéjar is a fusion style between Islamic and Christian traditions. It evolved in areas where the Christians reconquered land from the Moors from the 12th century on. Islamic craftsmen and builders kept on working, and the new churches that were built copied the structure and decoration of minarets. Then they added gothic or baroque ornaments, and included Christian imagery. I only visited the town of Teruel out of this serial nomination covering 5 separate cities. Teruel is the site of the original nomination from 1986, and also the one with the earliest surviving examples of Mudéjar architecture. I drove there from Valencia Airport, and on the way I encountered already many towns with the characteristic minaret-like bell towers. They are slim and tall, made out of brick and decorated with glazed tiles. This motorway is aptly named 'Autovia de Mudejar'. 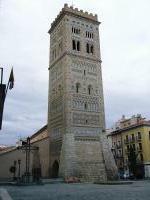 Teruel has two free standing Mudéjar towers, and two more adjacent to churches. On approach of the city center, the panaroma is excellent, with oriental, exotic touches. Up close the towers appear well-cared for, sometimes in stark contrast with the surrounding dilapidating modern structures. I also entered both nominated churches in Teruel. The cathedral has a complete decorated wooden ceiling, which is praised as thé number one Mudéjar remain. However you need binoculars to take it all in, the ornaments are too far away to see clearly. The church of San Pedro lived up to its promise: its interior could have been taken away completely from Morocco. Although I wouldn't rate this as an unmissable WHS, it is an interesting addition to the total picture after you've seen the masterworks of this tradition in Morocco and Andalucia. Mudéjares were the Moorish architects and craftsmen who stayed in Spain after the reconquest of the Iberian peninsula by the Christians. 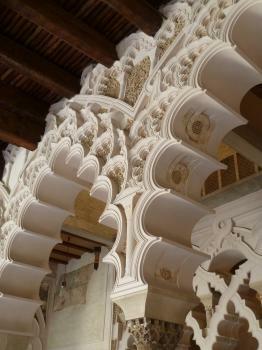 The Christian kings used the skills of the Mudéjares for their representative buildings. As a result the Mudéjar style emerged, a fusion of Moorish decorative elements and the Christian architectural styles of the Romanesque and Gothic. We visited the three sites in Zaragoza in May 2014. The exterior of the Cathedral La Seo is a weird mix of styles, from the Plaza del Pilar you can spot the Romanesque apses with Mudéjar design, the Baroque bell tower, and the Neo-Classical façade of the main entrance. The best example for the Mudéjar style is the exterior wall of the Parroquieta chapel, beautifully decorated with a geometric pattern made of bricks and glazed tiles. 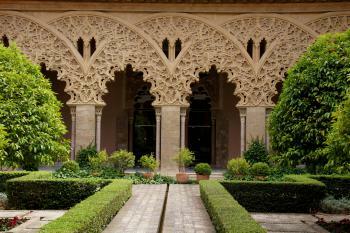 The exuberantly decorated interior is also worth visiting although it has no Mudéjar elements. The second site, the Parish church of San Pablo, is just a few hundred metres from the city centre. 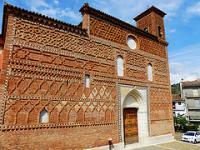 It is entirely built of brick, most striking is the octagonal bell tower with Mudéjar decorations at the upper floors. The highlight of our visit was the Aljaferia Palace. Used as a summer palace in the 11th century, it now houses the Regional Parliament of Aragon and administrative offices, but the oldest parts are used as a museum and are open to the public. The heart of the palace is the beautiful patio of Santa Isabel (photo), the columned hall and the adjacent Islamic rooms. The rooms in the upper floors are from the Christian period, noteworthy are a series of state rooms with richly decorated coffered ceilings, called Artesonados, also a characteristic element of the Mudéjar style. The largest and most elaborate example is in the throne room. The Aragon Mudéjar WHS comprises ten locations and I've visited only three of them, so I can not finally assess the value of the site. However, I was much more impressed by the Alcazar in Seville (that I visited ten years ago), and I suppose that the Alhambra is also a better example of Moorish architecture. I visited this WHS in May 2014. I visited 4 out of the 5 localities included in this WHS and I visited 6 out of the 10 outstanding Mudejar buildings mentioned by UNESCO. In Zaragoza, I visited all 3 sites and I must say that the interior of the Aljafería Palace was my favourite. I haven't visited Granada and Alhambra yet so I'm glad I visited this site before which surely helped me appreciate its beauty even more. The La Seo Cathedral costs 3 euros to visit however there isn't much Mudejar architecture left to see inside. Nonetheless, if you're not pressed for time, do visit as there is an interesting tapestry collection displayed inside. The Mudejar architecture of La Seo is clearly visible on the lateral side just beside the Diocesan Museum. The Church of San Pablo too is best viewed from the outside from where you can gaze at the ornate brickwork on the bell tower. Zaragoza offers more Mudejar sites other than those mentioned by UNESCO which I visited during the 2 days I spent here. Obviously you cannot miss the huge Basilica of Our Lady of Pilar and on one of the tall church towers opposite the Ebro river bank you can go up a lift to enjoy an amazing view of all the spires in Zaragoza as well as the several bridges on the Ebro river. A few photo tips: best light for the panoramic view from the Basilica is late afternoon; same applies for the La Seo Cathedral and San Pablo Church. The best light for the Aljafería Palace entrance with all the towers is in the morning. Had I visited only Zaragoza I would concluded that this WHS is interesting and worth visiting but nothing very special on the whole. However, after I spent a couple of days driving around the province of Calatayud, I really could appreciate the magnitude and importance of this WHS. Perhaps the city of Calatayud itself doesn't offer enough of a wow effect as it only offers a sort of continuation of the Mudejar architecture visible in Zaragoza. Again, apart from the beautifully ornate brickwork on the tall tower of the Collegiate Church of Santa Maria, there are quite a lot of other Mudejar buildings to visit and most of them have white storks nesting on them. Once I drove out of the city of Calatayud and stopped to take a photo of the panoramic view of the city with all its spires and towers against a background of rolling hills, the landscape changed completely and it become much more picturesque and desolate at the same time. The remote villages of the Calatayud province turned out to be a real treat! I had a great time driving from one small village to the next, each offering splendid examples of Mudejar architecture - with the highlight being the brick fort churches. Online I found a very informative and useful website with an interactive map of Aragon showing all the Mudejar highlights in every province (http://www.aragonmudejar.com/mapgen/general.htm). After checking out the interactive map of the province of Calatayud, I decided to visit the Church of Santa Tecla in Cervera de la Cañada first. Although the local people there are very friendly, I cannot understand why UNESCO highlighted this church over others nearby. Don't get me wrong, I'm glad I visited, but I would recommend spending more time exploring other nearby villages which have better examples of Mudejar architecture such as the Church of Our Lady of Castillo in Aniñón or the Church of San Felix in Torralba de Ribota where you can find a few information boards present and also a UNESCO plaque present. After a long winding drive I finally got to the remote village of Tobed where I visited the Church of Santa Maria which is rightly mentioned by UNESCO as one of the best example of Mudejar architecture in Aragon (photo). Having visited all these sites and knowing that these are just the best examples of Mudejar architecture in Aragon, I really got to appreciate the OUV of this WHS and the fusion of Christian and Islamic art styles. Hopefully, I will get to visit Teruel in the near future when I visit Valencia. This is a quite interesting and rather unique site spread over several places in the northeastern region of Aragon. It includes churches and secular buildings combining Christian (Gothic) and Muslim architectural features and decorations. 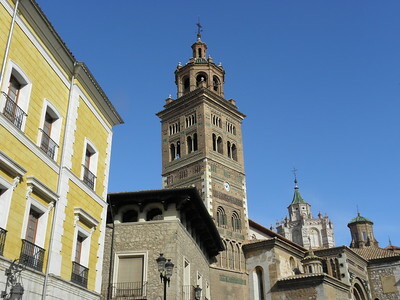 The site is centered on the pretty town of Teruel, where it includes the Tower of El Salvador (which houses a nice museum), the Tower of San Martï¿½n (not accessible), the cathedral (impressive from the outside, but not really great inside), and the Church and Tower of San Pedro (very nice, but can only be visited with a Spanish-only guided tour; it includes a museum about a local legend featuring 2 star-crossed lovers). Those arriving by train will notice a huge fake-Mudejar staircase leading into town. The major city of Zaragoza also includes a few Mudejar buildings, the most interesting of which I found to be the large, fortress-like Aljaferï¿½a Palace, which is a smaller version of the Alhambra and has a really beautiful courtyard. The La Seo Cathedral is also very impressive, both inside and outside. San Pablo Church and Tower is easy to find between the Aljaferia and the Cathedral, but was closed when I was there (the tower and the facade are the most interesting part anyway). Even though Zaragoza is not on most people's itineraries, it has a fair number of interesting sites (the most famous is the huge Pilar Basilica) and is on the high-speed train line between Barcelona and Madrid. From there, I took a quick train ride to the small town of Calatayud, where the Tower and Church of Santa Maria is inscribed (again the church was closed, but you can see quite a lot from the outside). The WH site also includes 2 churches in the small villages of Tobed and Cervera, but I couldn't even find them on a map. I really enjoyed hunting out the Mudejar sites, and I found all of them to be beautiful and well-preserved. If you have trouble with Spain's opening times, it is safe to say that the interesting part in most buildings is the facade, so it is not absolutely necessary to see the inside as well. The three parts of this site located in central Zaragoza provided me with a great weekend break in yet another lively Spanish city. I was particularly impressed with the Aljafería palace, after not expecting much it turned out to be pretty impressive. From the outside it looks like a rather austere fort, however as other reviewers have stated the interior courtyard is rather magnificent, looking like a smaller version of the Alhambra. The bright sunshine trickling water and cooling shade certainly made it a wonderful place to spend a slow Sunday morning. The walk back to the centre led me past San Pablo church, which has a rather large tower and pretty dazzling altarpiece. Central Zaragoza turned out to be a rather impressive place, the main square is bounded by the massive Basilica of Our Lady of the Pillar which is well worth a visit to see its over the top baroque interior, and the views from the tower and bridges behind are distinct highlights of the city. When I visited the square was the site of protests about the economic problems facing Spain at the time. It gave the city a rather distinct atmosphere as well as giving me a few more people to talk to. At the southern end of the square is the third part of the inscription, le Seo cathedral. As Assif states below, the Mudejar aspects are mostly viewable from the exterior, however the interior is well worth an exploration, again the altarpiece is rather fine. A walk a past the fine Mudejar details on the outside of the cathedral will lead you in the direction of la Madelina church which also has some wonderful decoration, and more importantly some excellent bars. Sometimes I think that I have chosen the best hobby imaginable. Instead of spending a dull drizzly weekend in London I went bar hoping and sightseeing around yet another lovely sunny Spanish city. I really love visiting these cities that would otherwise be off my travel itineraries. And mingling with the locals in the terraces outside numerous bars and café’s was a great way to see Spanish life away from the main tourist centres. The Mudejar architecture was impressive, with the Aljafería being the distinct highlight; however Zaragoza itself was well worth a leisurely couple of days to explore and relax. I attended a conference in Zaragoza and naturally used the opportunity to visit its share of the Mudejar WHS nomination. Three of the inscribed monuments are in Zaragoza and the rest are scattered in other parts of Aragon. The Aljaferia palace is the seat of the Aragonese parliament and only part of it is open to visitors. What I found most striking was the combination of Moorish architecture with some clear symbols of Islam (such as the mihrab or the Arab calligraphy) and Christian medieval motives in the wooden carved ceilings. It isn't so much a true Mudejar building as this style only evolved after the reconquista and reflected an attempt to combine the Moorish style with Gothic one. The Aljaferia, on the other hand, is one of the only Moorish monuments which survived intact outside of Andalucia and is therefore earlier. Nonetheless, it didn't remain unchanged and the Aragonese princes lived in it and adopted it to their needs. For me it was unbelievable to imagine a Christian prince living in such a Muslim looking palace. The Cathedral of La Seo is a very impressive cathedral. Its inner centralized nave is beautiful. However, I couldn't see much of its Mudejar characteristics in its interior. Those are evident, however, in the chruch's exterior, mainly from the northern side where you can admire the typical ornaments at the bell tower and its surroundings. The cathedral also features a collection of goblins of world importance that used to hang in the church itself and is now on display in a nearby building. The third monument, Church of San Pablo, I found less spectacular. Not far away is another Mudejar church not part of the WHS which I found much more impressive - Santa Maria Magdalena. I don't know why it wasn left our but it is certainly worthwhile visiting. Apart from the WHS components I would recommend Zaragoza's municipal museum with its impressive collection of Roman mosaics from Zaragoza's predecessor Caesaraugusta as well as a collection of Goya, Zaragoza's most famous son. For nice modern architecture you should visit the grounds of Expo 2008 that still display the original bridges and pavilions of some great names such as Zaha Hadid. The most noticable feature that all the towers have in common that I have visited (in Calatayud, Zaragoza and Teruel) is the skill displayed by the bricklayers in creating the varied and ornate patterns. In Calatayud, I found Santa Maria's church only a short distance from the station, past the Plaza del Fuerte. In Zaragoza, bus #51 took me from the station to the Aljafeira, a minature version of the Alhambra at Granada without the fountains. From here I walked to the cathedral via the church of San Pablo, and then returned to the station by bus #52. Exiting the station at Teruel I was greeted by a long ornamental brick staircase (escalinata) which leads up to the town. But hidden behind the staircase are two lifts that take you up much more speedily. Once in the town the damage caused during the Civil War is immediately apparent. The four towers here differ in that they incorporate bricks of different colours. From "Mudejar Architecture of Teruel" to "Mudejar Architecture of Aragon"
Sites of Parliament: Aragon parliament at the Aljaferia in Zaragoza. Ancient Roman colonies: La Seo Cathedral in Zaragoza is located above the ancient Roman forum of Caesaraugusta. Opera: Verdi's Don Carlos takes place at the Aljaferia palace in Zaragoza. 149 Community Members have visited.